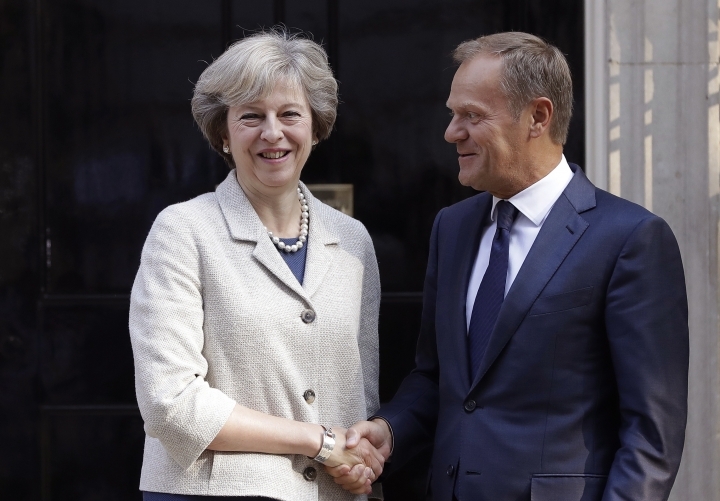 LONDON — A European Union leader urged Britain on Thursday to hurry up and get on with finalizing its divorce from the bloc. 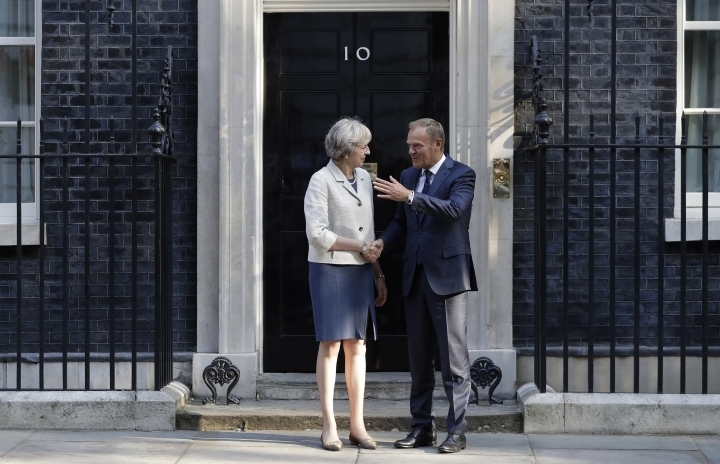 Donald Tusk, president of the EU's governing European Council, met with Prime Minister Theresa May in London for talks about the fallout from Britain's June 23 vote to leave the EU. 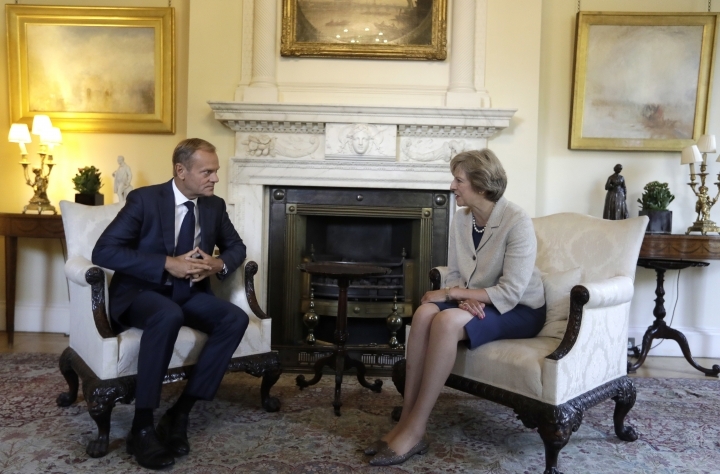 Before the meeting, Tusk told May that "the ball is now in your court" to start negotiations. He said the process should begin as soon as possible. "I have no doubt that at the end of the day our common strategic goal is to establish the closest possible relations," he said. 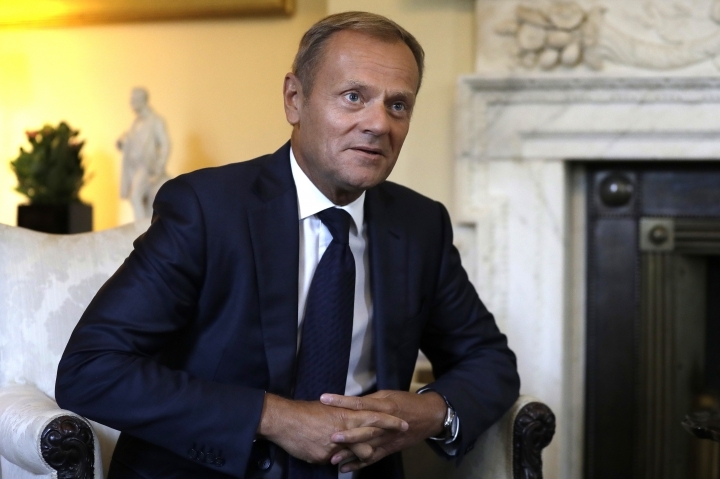 May's spokeswoman, Helen Bower, denied that Tusk's comments were an attempt to put pressure on Britain. She said "there wasn't a sense in the meeting that we are under pressure on this." 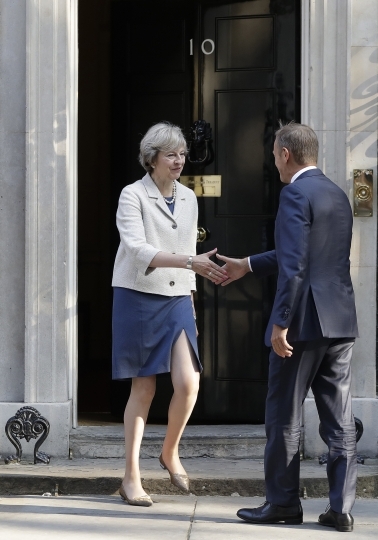 May has signaled that she is in no rush to trigger the formal two-year round of exit talks with the other 27 members of the EU, amid divisions within her government about the kind of deal Britain hopes to strike. Brexit Secretary David Davis said last week that it was "improbable" Britain could remain in the EU's single market in goods and services while imposing restrictions on immigration from EU countries. Free movement of people among member states is a core principle of the bloc. May's spokeswoman later stressed that Davis was expressing his own opinion, not government policy. May told lawmakers on Wednesday that her government would "think through the issues in a sober and considered way." "We will not take decisions until we are ready, we will not reveal our hand prematurely and we will not provide a running commentary on every twist and turn of the negotiations," she said. Meanwhile, EU lawmakers on Thursday appointed former Belgian Prime Minister Guy Verhofstadt to represent the European Parliament in Brexit negotiations. The assembly has to approve any future agreement on Britain's departure and Verhofstadt will work alongside French politician Michel Barnier, who is leading the European Commission's negotiating team. Verhofstadt's appointment may irk British Euroskeptics, who regard him as a fervent supporter of the EU's policy of ever-closer union, which they oppose. The bloc hopes to complete exit negotiations before the next elections to the European Parliament are held in the second quarter of 2019. May has said she won't invoke Article 50 of the EU constitution, the trigger for talks, before the start of 2017. Associated Press writer Lorne Cook in Brussels contributed to this story.